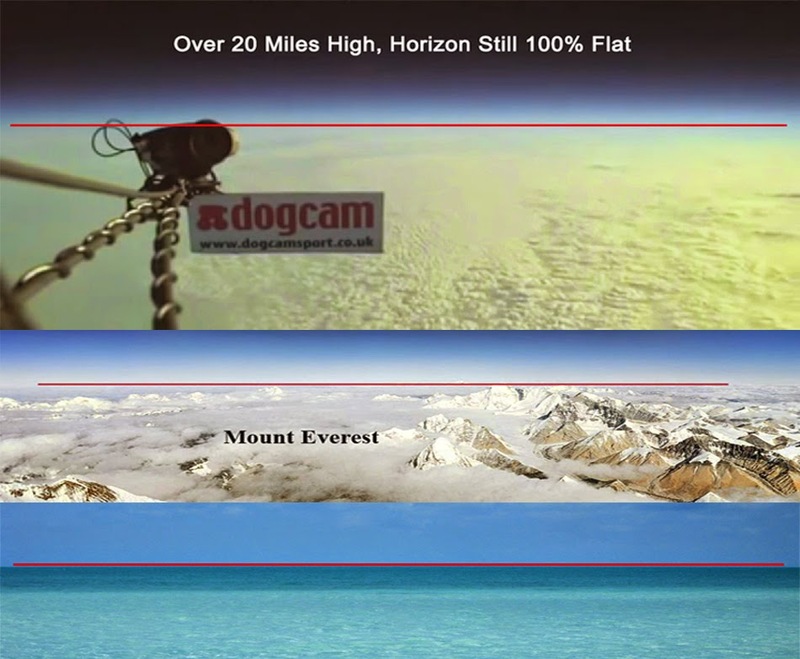 Another compelling proof is the lack of curvature of the horizon. It is always flat! Show us your pics and share your experiences. This is a proof that the earth is flat because the curvature of the earth is enormous. For example after 120 miles there should be 9600 feet of curvature. see here . It is an exponential rate of curvature. Verifiable mathematically. Wouldn't this be visible? And yet not the slightest bend. Consistently flat, especially at water where we know it is level. All the more should there be a curve the higher we go up. And yet nothing. A proof accessible to all without any equipment. ---To the common objection that "the earth is so big that you would hardly see the curvature", we respond that you would, albeit small. For example for only 90 miles across, you would see a drop in over 5400 feet. ---Some also try to argue that when you take a straight line cutting of a sphere (as if you put a knife through an orange) and looked at it from the centre it would be flat. This is completely contrary to common sense and there are no real life examples. The definition of a sphere is that it is a circle in 3D, ie from all directions. A good video which shows the comparison between what it should look like as a globe and what it does look like actually. This is an excellent video for skeptics. He had gone through flat earth videos and was never convinced. What he shows is that there is no curvature. However he does not conclude that the earth is flat! Just that where he was looking at was flat! This is an example of the mental sickness plaging many who look into it. What they fail to realise is that proof of the flat earth does not depend of them. When flat earthers don't convince them, they just move onto someone else. They are not that important. The thesis of the flat earth is simple:"what we know of the earth is flat". All the collected evidence confirms this. The thesis is not: "joe bloggs sees there is no curvature, but cannot conclude that the earth is flat, therefore it is not flat." It is a classic example of the vice of pussilanimity, the contrary to constancy, that is a sinful timidity and inability to stick to a decision made or to be made. It is typical of cowards. So let's remember, lies are our enemy, the Truth is a our friend and liberates us (in the good sense). Let's trust in that Truth and follow it.